The DASH Diet has been been named as the best diet to follow for the eighth year in a row. For those of who you may be unaware, DASH stands for Dietary Approaches to stop Hypertension. This means that the diet is used to help prevent high blood pressure and cholesterol. There are plenty of diets out there and we’re always hear different things about each one. Today’s article takes a closer look at the DASH Diet to help you understand what you need to be doing in order to follow it. As we’ve already mentioned, the DASH Diet is heavily linked to the prevention of high blood pressure and cholesterol. It was originally developed by the National Heart, Lung and Blood Institute (NHLBI), and is a long-term commitment to eating healthily. The diet has also been recommended by the National Kidney Foundation, with studies showing that it also has a decrease the risk of heart disease, strokes and cancer. By following the DASH Diet you can reduce your blood pressure by a few points within a couple of weeks. The dietary recommendations can also prevent osteoporosis, which affects one in two women over the age of 50. This diet should not be used by people on dialysis. Individuals on dialysis have special dietary needs that should be discussed with a registered dietitian. Hypertension is a long-term medical condition, where the blood pressure in your arteries is constantly elevated. It is not something that you will usually feel or notice, but overtime it will but a huge amount of pressure on your heart. High blood pressure is measured at 140/90mmHg or higher. Your ideal blood pressure should be between 90/60mmHg and 120/80mmHg, although as we get older your ‘normal’ blood pressure may naturally change. 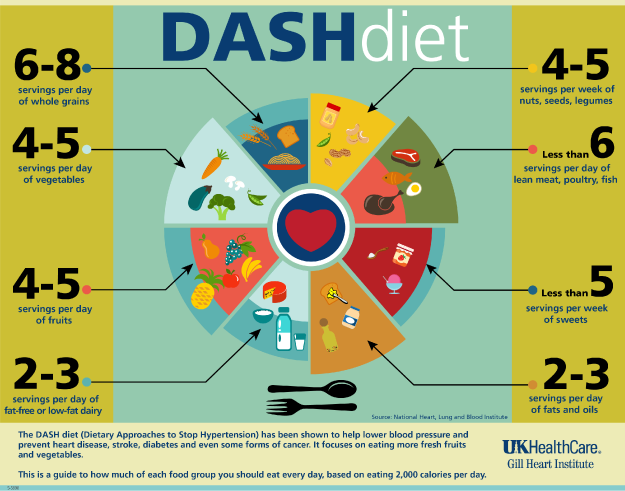 The DASH Diet is made-up of low-fat dairy products, whole grains, fish, fruits, vegetables, beans, seeds, poultry and nuts. It is low in salt and sodium, added sugars and sweets, fat and red meats. Overall, the core aim of the diet is to reduce the amount of salty foods that you eat, whilst focusing on eating the above. Meats, poultry and fish – 6 or less. They also suggest that you have 4-5 weekly servings of nuts, seeds, dry beans and peas, with five or less servings of sweets. It is stressed that those following the DASH Diet should choose foods which are low in saturated fats, rich in potassium, calcium, magnesium, fiber and protein, and lower in sodium. Breakfast – Two Pumpkin Pancakes, topped with ¼ cup walnuts, one tablespoons of honey, and one sliced banana. Alongside eight ounces of non-fat milk. Lunch – Pasta Salad, using half the usual amount of olive oil and removing the cauliflower. You should use whole grain pasta and top your salad off with four ounces of water-packed tuna. Have this alongside a fresh peach and a drink of water. Dinner – Spicy chicken salad lettuce wrap. For this you will need: ¾ cup spicy chicken salad, 3 Romaine leaves; Use ¼ cup chicken salad per leaf. You can also have a citrus fruit salad, 10 whole grain crackers and water. Snack – A blueberry yogurt parfait. Breakfast – Two breakfast sandwiches, a tropical fruit salad and eight ounces of skim milk. For the wrap, use one whole wheat English muffin toasted and split, one scrambled egg white, one slice reduced fat (2%) cheese and one slice tomato. Lunch – One cup Snow Pea and Orzo Salad and water. Dinner – Pasta Bolognese, with a baked potato with butter and cheese, a whole grain roll and water. Breakfast – Tacos, using the following: One whole wheat tortilla, Two scrambled egg whites, One slice tomato, 1/8 of an avocado, and One tablespoon of reduced-fat shredded cheddar cheese. Alongside a fruit salad, eight ounces of skim milk and six ounces of freshly squeezed orange juice. Lunch – Roasted garlic pizza with chicken, mushroom and olive oil. Alongside a Mediterranean salad and a drink of water. Dinner – Ginger roasted chicken, brown rice, roasted asparagus and glazed carrots. Please visit the National Kidney website above for further details.